1. 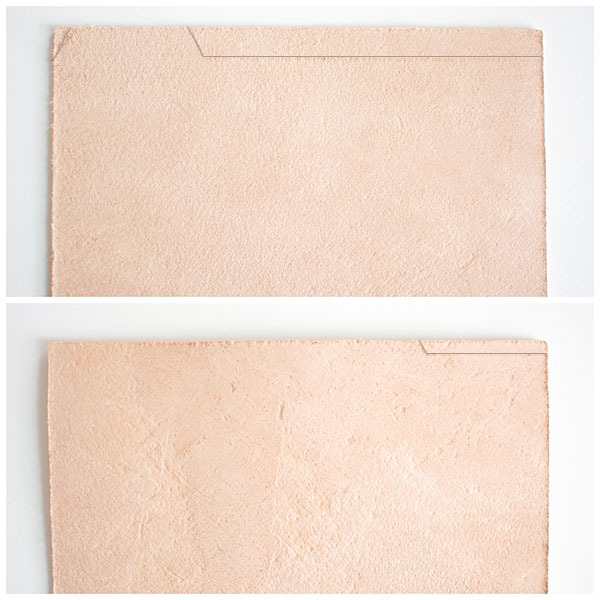 Use a pencil and ruler to draw out the tab shapes on opposite ends of the leather. 2. 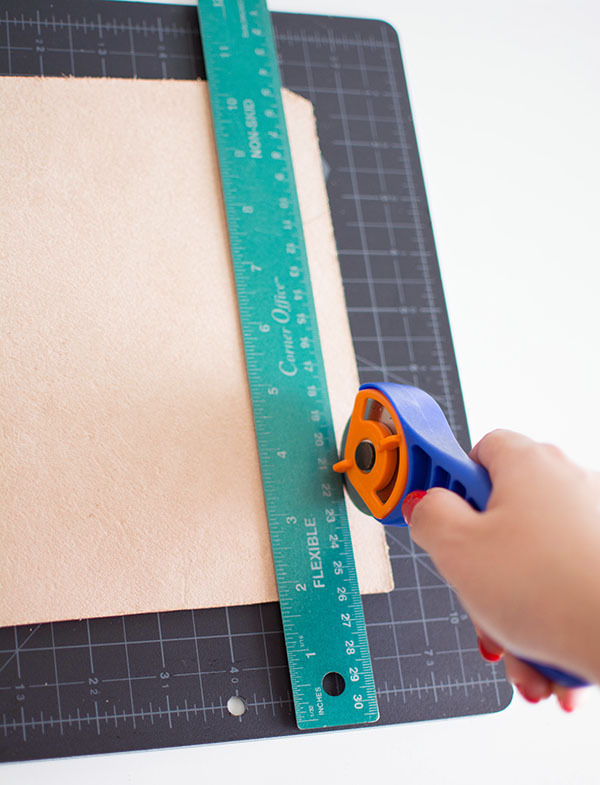 Cut along the pencil lines with a rotary cutter and/or X-ACTO knife while holding a ruler right along the lines for straight cutting. 3. 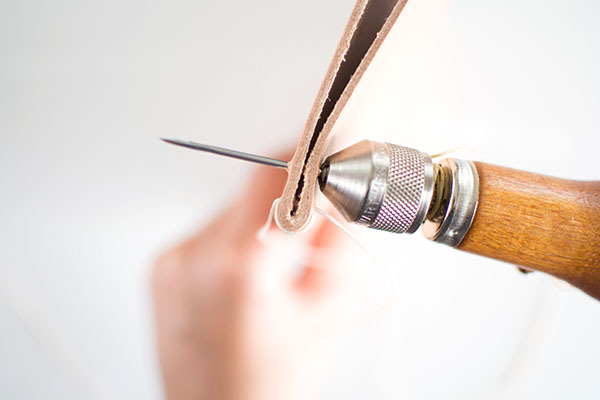 Fold over the leather so that the bottom edge comes up just a little short of lining up with the top edge and use a mallet to pound along the fold. 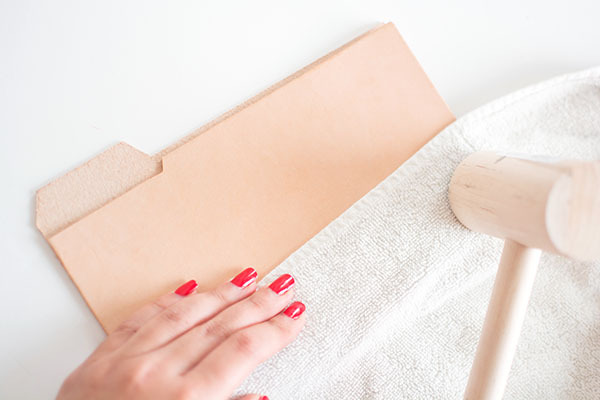 Cover the leather with a towel to protect it from mallet marks. 4. Thread a stitching needle and poke the needle through the thread. 5. Pull the needle through the thread, then twist the thread tight. 6. Repeat steps 4 and 5 to the other end of the thread. 7. 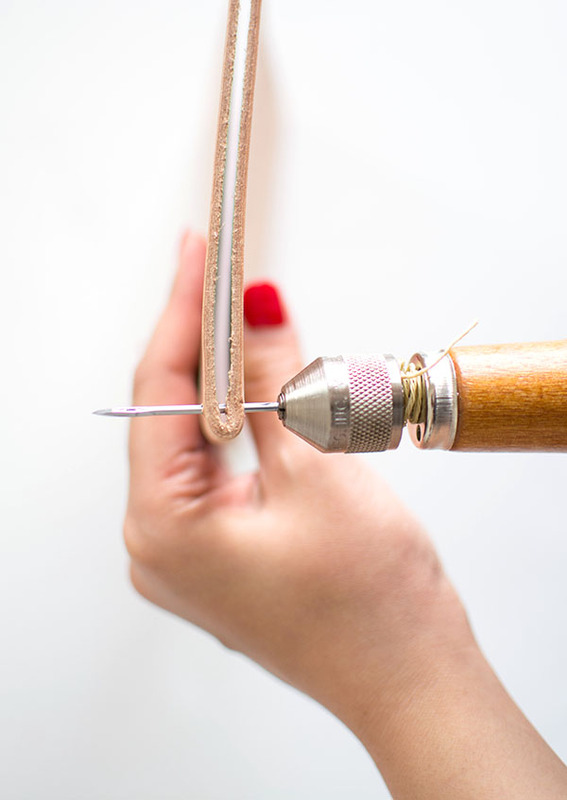 Pierce a hole with a leather awl through both layers of leather near the bottom corner of the folder. 8. 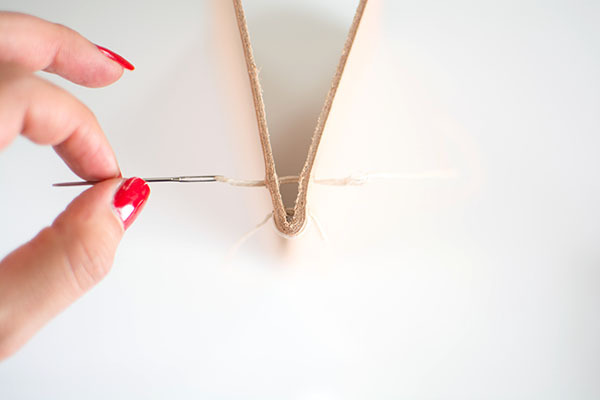 Insert one needle into the holes and pull it through until the center of the thread is between the two holes. 9. 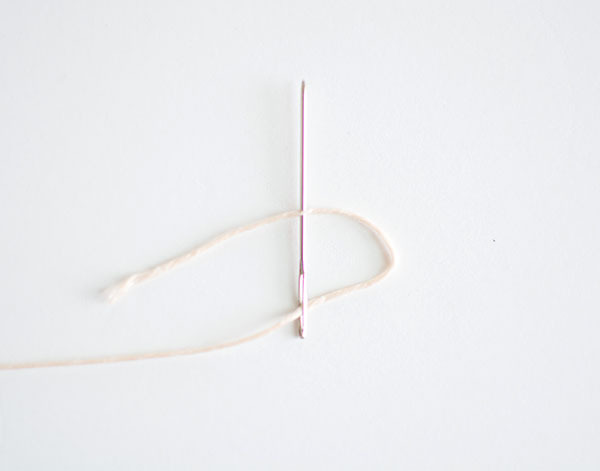 Switch the needles to the opposite hands and pass them through the same holes again one at a time. This creates a double loop with the thread. 10. Pull both ends of the thread tight. 11. Pierce another hole along the edge of the folder. 12. Insert the needle on one end through the hole to the opposite side and pull it through tightly. 13. 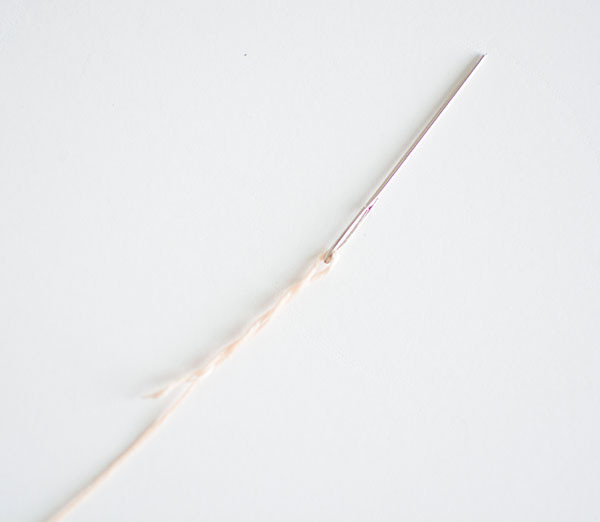 Insert the needle on the other end through the same hole to the opposite side and pull tightly. 14. Repeat steps 10-13 along the entire edge. 15. 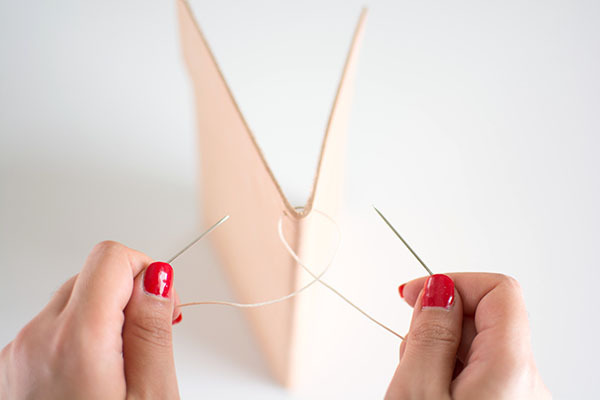 At the last hole, knot each end of the thread and cut off the excess. 16. Lightly pass a lighter flame over each knot a few times. You’ll see the wax from the thread melt into a ball. 17. 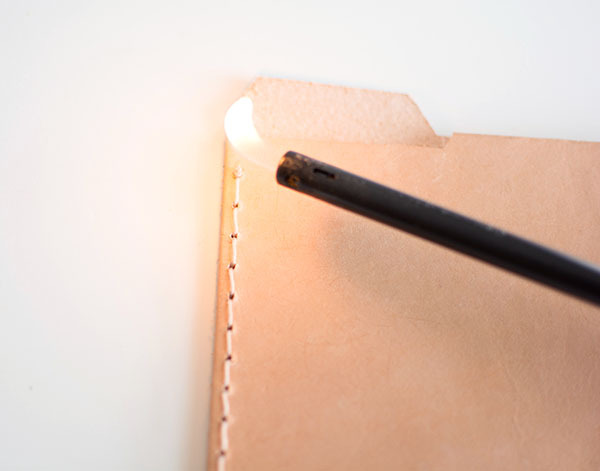 Repeat steps 5-16 on the opposite edge of the folder. 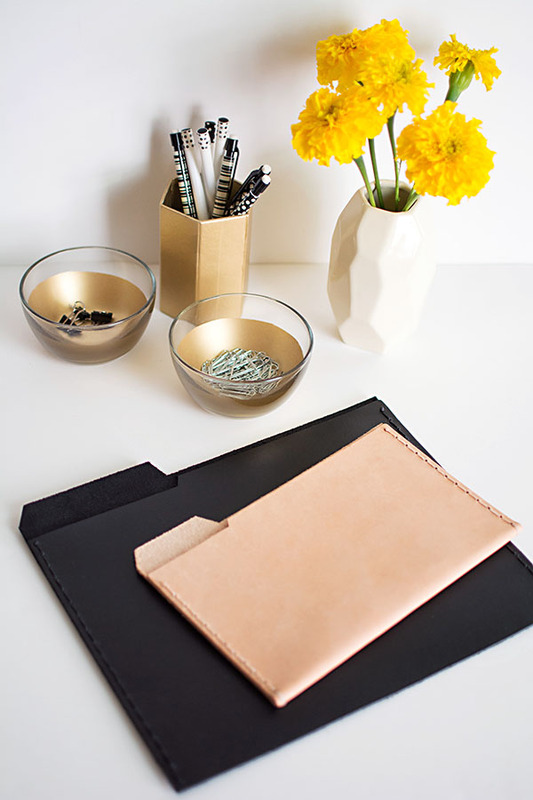 I love this project, and I just happen to have some leather scraps in my workroom. Thanks for the day’s inspiration. 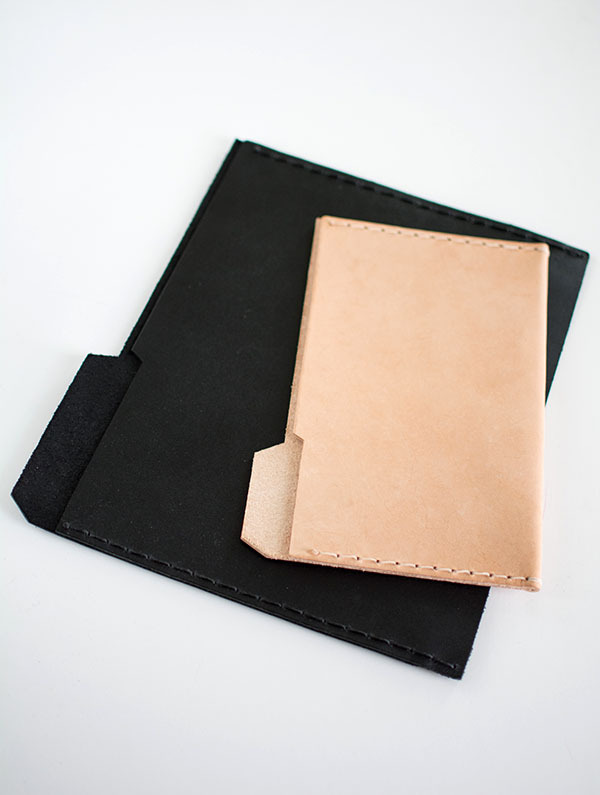 These are not only beautiful, but way more durable than my normal folders! I love these! So smart, simple, sophisticated – perfect! These are so beautiful and practical! Wow. This is such an awesome DIY! 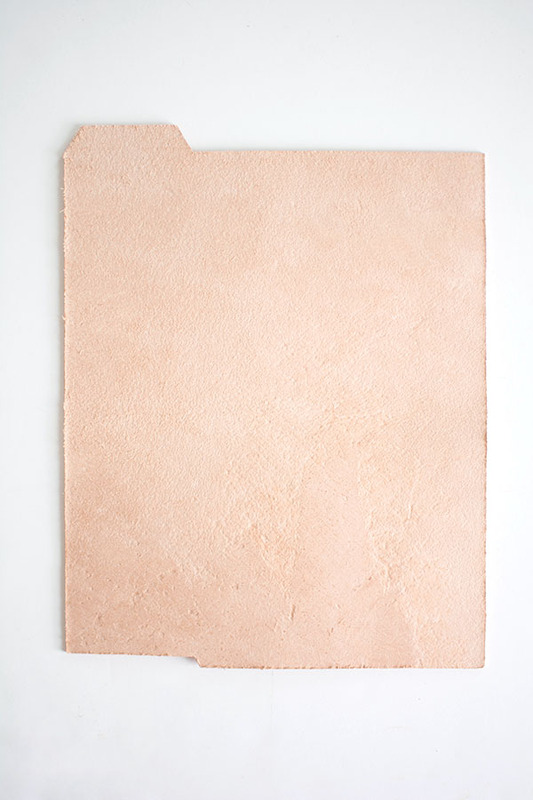 I love that you can re-purpose leather scraps with this project. I definitely need to try this one day. Hello! Where can I buy same leather online? 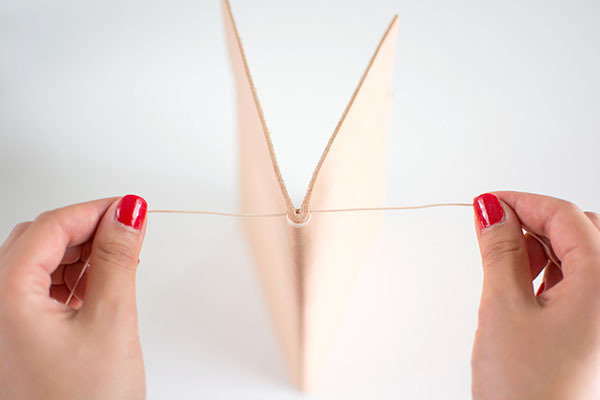 That is such a beautiful idea and seems to be easy to make…maybe you could use studs instead of the thread? What a great way to step up your work space! Wish I’d seen this before I did my post on office essentials! I’m actually pretty disappointed to be seeing this “CREATIVE DIY PROJECT” as I have been making these for two years now. I’m sorry that you feel this idea is too similar to your product. I know how it feels to have work taken without credit, but I’m afraid that is not the case with this project. 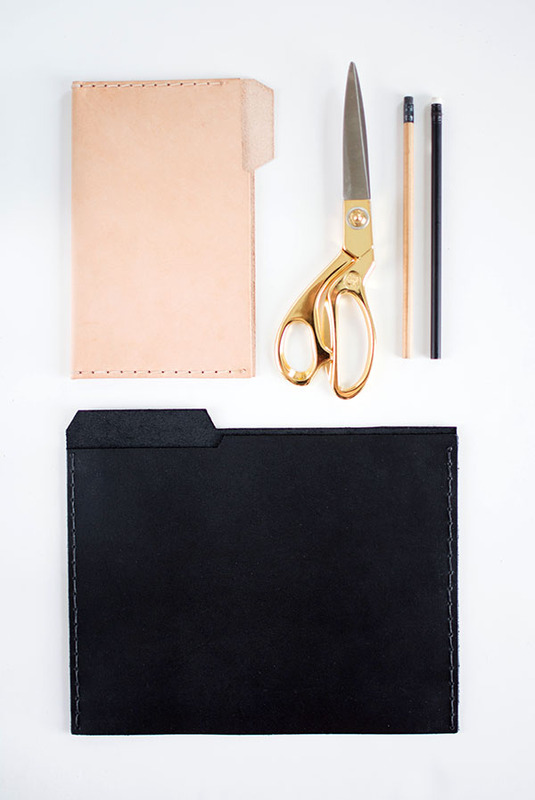 Leather folders, envelopes and portfolios have existed for a long time and have been a part of our office DIYs for years. We were looking to build off of this project from 2011 and we looked at several sources of inspiration for this project (the majority of which were produced more than 2 years ago) and chose the leather colors, natural and black, based on the most popular colors we’ve used in the past 5 years of leather DIY projects. with reference to this post. Thanks for the inspiration! Do you realize how many people make hacks, and diy similar off products from stores and brands? Ex. Search on Pinterest “West Elm DIY”. I see that you might feel that this may take sales away from you since it’s similar. Unless you’ve trademarked the idea, it is free for all. Thanks for sharing this tutorial! Are the gold/glass bowls and cup in the last image also DIY? I would love to know how you made them! But, I was wondering what kind of thread is the one you used? Maybe a wax covered thread or something like that? Rachel, I would use a heavy ‘upholstery’ or rug thread. Hemp or linen would be good, and one that’s waxed. it seems a bit difficult to follow. SO Classy! How much larger did you cut your leather for each folder size? And how far from the outer edges did you start your stitches? Thx! $$$ or lack of it should not be an obstacle to not give a project or creativity a try! Go to a thrift store, purchase an old leather jacket, cut it following the pattern and, voila! Who knows, one may be up to a great business and start REUSING, RECYCLING leather envelopes, pouches, bracelets, purses, etc., and final product may be more relevant!! !